Sarah Crichton Books, 9780374192716, 260pp. In quaint Haddonfield, New Jersey, Tess is about to marry Gabe in her childhood home. Her mother, Helen, is in a panic about the guests, who include warring exes, crying babies, jealous girlfriends, and too many psychiatrists. But the most difficult guest was never on the list at all: a woman in a wedding dress and a gas mask, armed with a rifle, a bomb trigger strapped to her arm. 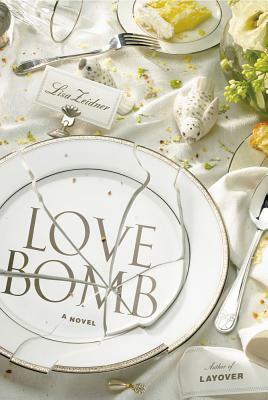 Lisa Zeidner's audacious novel "Love Bomb "begins as a hostage drama and blossoms into a far-reaching tale about the infinite varieties of passion and heartbreak. Who has offended this nutcase, and how? Does she seek revenge against the twice-divorced philanderer? Or is her agenda political against the army general? Or the polygamous Muslim from Mali? While the warm, wise Helen attempts to bond with the masked woman and control the hysteria, the hostages begin to untangle what connects them to one another, and to their captor. But not until the SWAT team arrives does "the terrorist of love" unveil her real motives . . . Critics have praised Lisa Zeidner's prose for its "unforced edginess and power"; her fiction "shines with humor, wisdom, and poignancy." In her most masterful novel yet, Zeidner gives us a tough yet tender social comedy, a romance with guts, a serious frolic written out of deep affection for all that it skewers. Lisa Zeidner has published five novels, including the critically acclaimed "Layover," and two books of poems. Her stories, reviews, and essays have appeared in "The New York Times," "Slate," "GQ," "Tin House," and elsewhere. She directs the M.F.A. program in creative writing at Rutgers University in Camden, New Jersey. “Cry at weddings? No? You probably would once Lisa Zeidner’s badass avenging feminist showed up in her gas mask and took you hostage—at least once you got done clutching your gut from the hilarity. Reading Love Bomb is like viewing the world through special glasses that make your perception off-kilter, keener, more attuned to the tragicomedy that surrounds us, to the gonzo miracle of love’s outrageous resilience.” —Karen Russell, author of Swamplandia!